The 2012 Summer Olympics spawned a digital deluge. There were reportedly 15 million downloads of the official London Olympics app, and 60 percent of visits to the Olympics website came from mobile devices. Social media buzzed with hundreds of millions of tweets and comments. Thanks to that second-screen surge, Rio 2016 is poised to be the first multi-platform Olympics. To make sure you don’t miss a second of complimentary content, we’ve compiled the most essential free apps to download. Whether you just want to stay on top of stats and scores, get an insider view of events, or follow your favorite athletes, you won’t miss a moment of Olympic action once competition begins on August 5. NBC Universal (NBCU) is the exclusive broadcaster of the 2016 games, and its free official app should be the hub of your second-screen experience. It provides coverage of the 2016 U.S. trials, athlete bios and profiles, video features, Olympic Talk reports and analysis, and full Rio Games competition schedules. And that’s all before the Opening Ceremony. 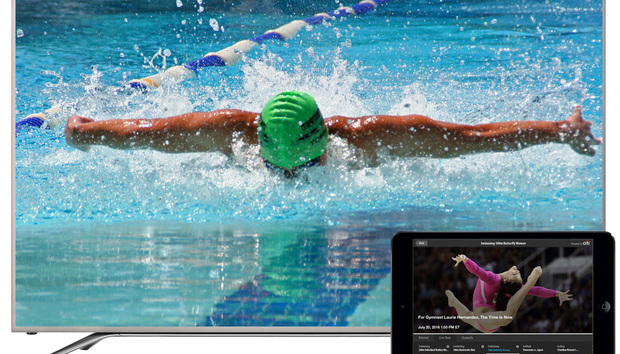 NBC Olympics: Rio News & Results is your one-stop second screen app. Once the games begin, you’ll also get real-time results and medal standings with alerts and notifications; TV and live-streaming schedules; and video highlights, news articles, and photo galleries for all 34 Olympic sports. This year’s app also sees the return of Primetime Companion, a second-screen feature that syncs with the NBC broadcast and lets you immerse yourself through polls, trivia, slideshows, videos and athlete bios. You can also share your Olympic viewing experience with friends through a set of integrated social tools. Want to relive Mark Spitz’s ’72 seven-gold-medal sweep or the women’s soccer team’s overtime gold win in 2004? You can do it with this app, your own personal Olympic archive. The Olympics is an archive of the modern games’ greatest events and Olympians. Linking to the official Olympics website, the app gives you fingertip access to Olympics programmes going back to 1896. Relive every triumph, upset, and record-breaking performance through a treasure trove photos, videos, and stats that span the modern games. You can scroll through a curated gallery of the greatest Olympians or search for medalists by games, country, and athlete. With its emphasis on history along as well as the latest IOC news and results from the Rio games, this app provides enriching context for your Olympics viewing. NBCU will air 6755 hours of Olympic programming across its channels and digital platforms. Chances are you won’t be near your TV or computer for all of them. This app is your ticket to Olympic viewing on the go. The NBC Sports app—formerly NBC Sports Live Extra—will live stream 4500 hours of coverage of the 2016 Rio Olympics. You also get video-on-demand previews and highlights, online-coverage schedules, push notification reminders for upcoming events, and full-event replays. But this is one app you’ll want to keep around once the Olympics conclude, as it provides the same features for other NBC Sports events, including NFL Sunday Night Football and Thursday Night Football, NHL regular season and Stanley Cup Playoff games, the PGA tour, Premier League soccer, and more. It isn’t for cord-cutters though; you’ll need to authenticate your pay-TV subscription to use it. Rio 2016 Social Hub puts you as close to your favorite athletes as you can get without setting foot in the Olympic Village. This official Olympic app connects you with the verified accounts of thousands of Olympians across Facebook, Twitter, and Instagram, and it aggregates all your favorite profiles in one place. Search by team, athlete, sport, or game, and create your own news feed of favorites to follow in Rio. Rio 2016 Social Hub aggregates thousands of Olympians social feeds in one place. The ceremonial journey of the Olympic Flame from Olympia Greece to the site of the games is one of the best-loved Olympic traditions. No surprise then that it has its own app. Rio 2016 allows you to follow the Olympic Torch as it is relayed through Brazil by 12,000 torchbearers, each of whom carries it for roughly 200 meters. The app provides photo-rich day-by-day accounts of the torch’s progress, along with the relay schedule, route maps, and a list of torchbearers. Articles and videos also detail the history and symbolism of this hallowed tradition. Rio 2016 tracks the Olympic Torch relay through Brazil to the Opening Ceremony. For those lucky enough to be in Brazil during the relay, the app lists associated street parties and other celebrations, as well as Olympic venue and ticket information. Can the men’s basketball team win a record third straight gold medal? Will Simone Biles win her first to solidify her status as the next great American gymnast? Can Michael Phelps live up to, or even surpass, his past glories in what is likely his Olympic swan song? Follow the storylines of all your favorite American Olympians with the Team USA app. These are just a few of the U.S.-themed storylines that will play out in Rio this August. The official Team USA app will make sure you don’t miss a single development. Chock full of exclusive Team USA content, the app delivers a wealth of news, features, photos, and videos leading up to and during the summer games. You can customize the home screen and push notifications to follow your favorite athletes, teams, or events. The app also includes a video-on-demand library of highlights and behind-the-scenes moments, as well as a real-time Rio results tracker for all Team USA events. It’s a big year for U.S. basketball. The men’s national team is going for a gold-medal three-peat, and the women’s team—arguably the best ever assembled—is expected to win its sixth straight gold. The recently relaunched USA basketball app makes it easy to follow both teams’ hardwood heroics. Follow the hardwood heroics of the national men’s and women’s teams with the USA Basketball app. The official team app overflows with behind-the-scene news, features, videos, and photos. You’ll go inside training camp with “wired” coaches and players, get in-depth profiles of your favorite athletes, and have access to up-to-date roster and schedule information. The app also integrates the official USA Basketball Twitter, Facebook, and Instagram accounts for even more insider content. It’s the next best thing to being in the locker room. Did we miss any of your favorite second-screen apps for enjoying this year's Olympic Games? Please share by posting a comment below.